The VascuTherm 4 is a multi-modality approach to the prevention of Venous Thromboembolism (VTE), post-operative pain, and edema. 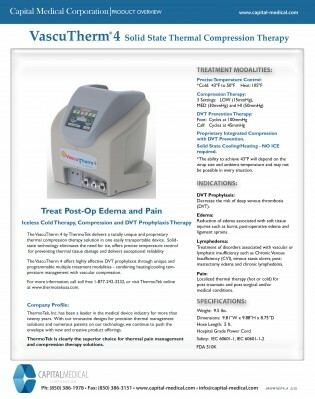 It delivers a totally unique and proprietary thermal compression therapy solution in one easily transportable device. Thermoelectric technology eliminates the need for ice, offers precise temperature control for preventing thermal tissue damage, and delivers exceptional reliability. The VascuTherm 4 offers highly effective DVT prophylaxis through unique and programmable multiple treatment modalities – combining cooling/heating temperature management with vascular compression. Deep Vein Thrombosis and Pulmonary Embolism (DVT/PE) are often underdiagnosed and serious, but preventable medical conditions. Deep vein thrombosis (DVT) is a medical condition that occurs when a blood clot forms in a deep vein. These clots usually develop in the lower leg, thigh, or pelvis, but they can also occur in the arm. It is important to know about DVT because it can happen to anybody and can cause serious illness, disability, and in some cases, death (CDC – Centers for Disease Control and Prevention, 2017). This type of post-surgical complication is very common and is an epidemic causing more deaths than HIV, breast cancer and automobile accidents combined (American Public Health Association, 2003). The positive aspect of this epidemic is that there are numerous preventative measures that can be taken to significantly reduce the risk of a DVT. Some of these preventive measures include mechanical IPC, pharmacological agents or a combined approach, which is considered a best practice. Orthopedic surgery, including total joint replacement and complex arthroscopic procedures, are known to be the highest risk surgical procedures; causing over 600,000 patients to suffer from DVT complications each year. In fact, in the absence of preventative treatments, 40%-60% of patients will suffer from DVT*; and according to the US Surgeon General, resulting in over 100,000 deaths per year. 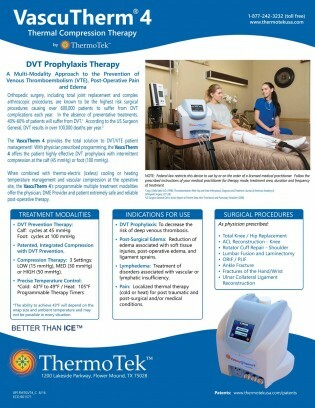 The VascuTherm provides the solution for DVT Prophylaxis Therapy. 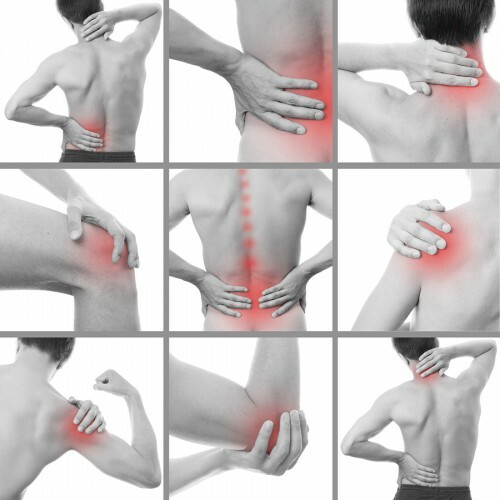 Soft tissue trauma from injury, overuse, or surgical intervention causes an inflammatory response. At the cellular level, trauma causes disruption at the cell wall and can damage the cell and surrounding cells. As a response, the cell attempts to repair itself using anaerobic metabolism, which cannot be sustained. Because of this, the damaged cell cannot regulate the concentration gradients and allows water to pass through. 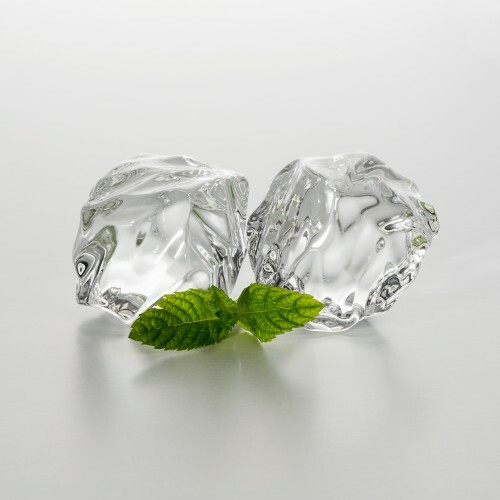 As water dilutes the cells, the body releases a number of chemicals to correct the issue and get rid of cellular debris. As this happens, vasodilation occurs, increasing blood flow and transporting of fluid to the inflamed area. This process accounts for the redness and swelling sometimes associated with inflammation. By utilizing cold therapy, the temperature of the tissue is lowered and the rates of the chemical reactions that actually cause the inflammation are slowed. Therefore, more cells survive, the damage slows, and healing is accelerated. The cold also acts as an analgesic and reduces the pain from any inflammation and the associated swelling. It should be mentioned that cold is effective only if used properly. Using a device that is too warm is not therapeutic, while using a device that is able to get too cold can cause damage to the tissue and nerves. The VascuTherm is one of the only ice-free devices available on the market, so temperature is precise and stable, therefore removing the worry of running out of ice or running another device at a low temperature that could potentially cause frostbite. The VascuTherm is regulated to operate between specific temperatures (43F-50F), therefore significantly reducing any risk of cold injury. The VascuTherm provides the solution for safe and clinically effective continuous cold therapy! Compression also aids the effectiveness of the cold therapy by improving the contact of the cold therapy wrap with the skin. Compression also helps reduce the excess fluid that can be accumulated after soft tissue injury or trauma. The compression also addresses the musculoskeletal injury by reducing the blood flow and swelling, removing the edema and reducing post-operative blood drainage, which can be an ictus for infection or hematoma formation. 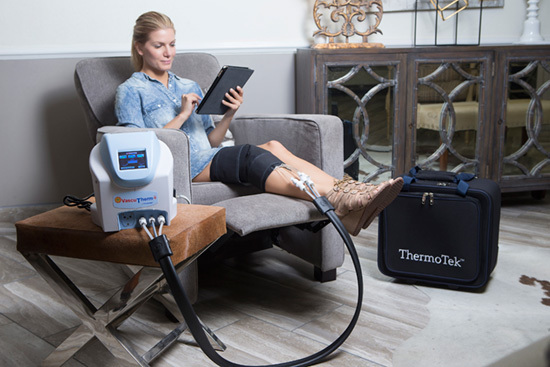 The combination of cold and compression therapy is very beneficial for patients recovering from orthopedic surgery and has many far reaching benefits. In multiple clinical controlled and randomized studies, the combination of cold and compression therapy has been shown to improve outcomes in numerous ways, including lower VAS pain scores, reduction of analgesics and narcotics, lower suctioned blood loss, improved range of motion 14 days post operatively, reduced hospital stays on an average of 1.5 days, and faster independent ambulation. The VascuTherm provides the solution for effective compression and edema management. This video provides an introduction, how to connect the power supply, how to connect the wrap and umbilical hose, and how to navigate the patient screens of the VascuTherm4.